Ivory Coast beat the Democratic Republic of Congo 3-1 on Wednesday as the Elephants reached their third final in the last six Africa Cup of Nations. Cool, calm and collected, the new, golden generation of Ivorians has a special presence. By ANTOINETTE MULLER. If history of previous meetings was anything to go by, then the first Africa Cup of Nations was going to be a cracker. The last time Ivory Coast and the Democratic Republic of Congo played each other was during the qualifiers for the Africa Cup of Nations. DRC won 3-4 as Ivory Coast stumbled to their first home defeat in nine years. The end result was indeed cracking, but not in the same way the last time the two teams met. Ivory Coast’s control and patience and a few moments of individual brilliance sealed a 3-1 victory over DRC to bring to an end one of the tournament’s remaining fairytales. 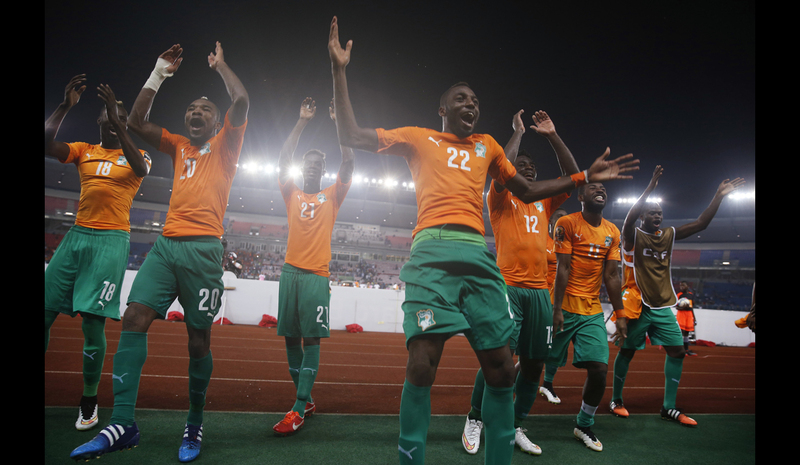 Goals for Yaya Toure, Gervinho and Wilfried Kanon fired Ivory Coast into the final. On paper, Ivory Coast were always expected to win this one. If they didn’t they would have been labelled chokers once more. They have now reached the final three times in the last six Africa Cup of Nations tournaments, and now have another opportunity to try to live up to expectations. Both teams started off slightly scattered, but it was DRC who started to apply the pressure first. It’s no surprise that possession was shared 50-50 by the time the final whistle blew. Ivory Coast opened the scoring, and Yaya Toure’s opening strike came, as if from the hammer of Thor, to set the tone for the way Ivory Coast were going to play. It was the first time in the tournament that Toure pushed forward more and it paid off. Just a few minutes later, though, the scores were squared up. A handball resulted in a penalty and Dieumerci Mbokani stepped up and slotted home cool as you please to level matters once again. The see-saw action continued and Gervinho put Ivory Coast ahead a few minutes before the half-time whistle sounded. Constant pressure from Ivory Coast saw the Congolese defence disintegrate, allowing Gervinho to latch onto a silky pass from Wilfried Bony and slot home from 16 yards out. Almost 20 minutes after play resumed, Ivory Coast were pushing forward once more. Their persistence paid off when Wilfried Kanon headed home from a rebound after his first effort from a Yaya Toure corner was saved by the entertaining Robert Kidiaba. From there, Ivory Coast did not have to do much. They could sit back and control the game, but they never allowed themselves to be complacent. Despite brief lapses of concentration, Ivory Coast were a class above their opponents. Cool, calm and collected with a marionette midfield that never ran out of options. Wilfried Bony’s wily omnipresence will be a great source of comfort for the Ivory Coast. He ended the match with two assists, showing that a striker’s role is about far more than just finding the back of the net. His pass rate had a success rate of over 80 percent and even in a more subdued role, he is still a handful. After a slow start in the tournament, the Elephants have improved steadily as each game went on. They have a special presence about them and that’s not just in reference to Yaya Toure’s size. Ivory Coast will now face either Ghana or Equatorial Guinea in the tournament final on Sunday. For all the fuss made of their golden generation fading without ever really delivering, it seems as if it’s the new generation that might finally help lead the Elephants for the glory that has evaded them for so long. For Herve Renard, whose fairytale title win with Zambia three years ago was extraordinary, the final will now be another chance to prove that he is not a one-trick pony. The Ivory Coast coach has already said that the aim is to win, despite having arrived at the tournament somewhat under the radar. “We came here a fortnight ago with no expectations on us. No-one was taking about us but this has changed over the last two weeks. Things change fast in football,” said Renard.